APS-C Format Sensor is the acronym of Advanced Photo System type-C. The size of APS-C Format Sensor is approximately equal to the film APS size negative. The original negative of APS measures 25.1 Ã— 16.7 mm with an aspect ratio of 3:2. Sensors with approximately of this APS dimensions are used on many consumer grade digital SLRs and on advanced Point and Shoot Camera, DSLM cameras etc. APS-C Format Sensor is considered inferior than standard 35 mm or Full-Frame Sensor but the cost is significantly less than that of Full-frame. 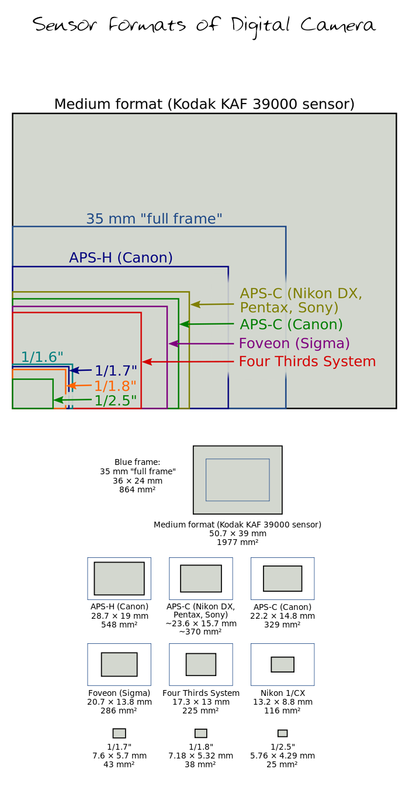 The size of APS-C Format Sensor vary by manufacturer to manufacturer and the model of digital camera. Each variant of sensor, used for the same purpose, will have a field of view slightly different, but overall this angle is always narrower than that taken with a 35mm film. In general, the APS-C format sensor are smaller than the conventional APS negative. The size of APS-C sensors and 24 x 36 film format are different, in the same focal length, an image is taken with an APS-C format sensor is different from that taken with a sensor or film 24 x 36. The APS-C format sensor is smaller, the image from the sensor appears to be an enlargement of a portion of the image taken with a 24 x 36 sensor. This is the crop factor. For the same image on APS-C format sensor DSLR and 24 x 36 mm film, the effective focal length of lens is 1.5 to 1.75 times larger . This multiplier is actually the size ratio between the sensors 24 x 36 and APS-C , it is referred to as “conversion factor”, “multiplicative factor” or “focal length multiplier”. This coefficient, which depends only on the size of the sensor can calculate the actual focal length of the lens used with this sensor, the equivalent focal length giving the same image with 24 x 36mm film sensor. Canon, Nikon and Sony have developed lens specifically for their DSLR camera. These lens are designed for APS-C sensors are always referred by their actual focal length and not that equivalent on 35mm film. Several manufacturers such as independent objectives Tamron , Tokina and Sigma also produce a range of lenses optimized for APS-C sensors. Canon has introduced the range of Lens Canon EF-S in 2003 at the same time of their launch of the EOS 300D model. The EF-S lenses can only be used on APS-C Format Senor equipped cameras from Canon, with the exception of the older models – Canon EOS D30 , D60 and old 10D that physically prohibit the fitting of this type of lens. The EF-S lenses can not be mounted on Canon full-frame DSLRs or 35mm film lens. Nikon introduced the DX-format lens for its range of digital SLR cameras with APS-C format sensor. They can be mounted on the model full-frame DSLR – D3, D3x and D700 at the cost of losing a few optical factors. These lens generally give the vignetting effect when mounted on Nikon film cameras, but can be used somehow. This Article Has Been Shared 8811 Times! Cite this article as: Abhishek Ghosh, "APS-C Format Sensor," in The Customize Windows, April 25, 2013, April 21, 2019, https://thecustomizewindows.com/2013/04/aps-c-format-sensor/.